When early 2016 Sindre Bjerga (Norway) and Frans de Waard (The Netherlands) decided to join forces on a tour through Germany and The Netherlands, they decided that a duo act would be in order as well; as both have a wide experience in improvised electronics it was decided not to add another duo of improvised music to the scene, but rather be a group with structured songs that needed planning and rehearsing. 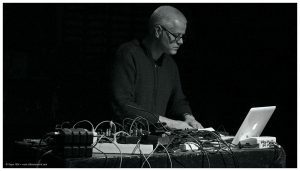 Eight song structures were prepared by Frans de Waard, entirely based upon drone material delivered by Sindre Bjerga, plus a bit of synthesizer and rhythm. On tour Frans mixed all of these materials live, while Bjerga added his synth noise, radio/Walkman cut-ups and microphone abuse. All of this resulting in a wild ride of rhythm ‚ n noise and drones. From the highly subdued to the overtly loud, one could think of early Cabaret Voltaire, Merzbow, computer glitch, cosmic synthesizers, minimal techno and massive drone and you may have something that is close to the Tech Riders sound. The eight pieces on ‚In The Sky‘ are a selection of recordings made on the road in 2016 and have very little to do (anymore) with the CDR that was sold as tour merchandise, also called ‚In The Sky‘. Confusing? Yes, it sure is, that’s Tech Riders for you.